Here's an important campgrounds closing notice posted recently in Rich and Sue Freeman's New York Outdoors Blog - one of the very best Internet resources for all things outdoors in New York State. The state Department of Environmental Conservation says six campgrounds in the Adirondacks and Catskills won’t open in 2009 due to the state’s continuing financial crisis. In the Adirondacks they are Poke-O-Moonshine in Keeseville, Sharp Bridge in North Hudson, Point Comfort in Piseco and Tioga Point in the town of Raquette Lake. 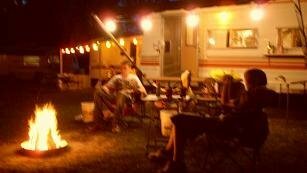 In the Catskills, the campgrounds are Beaverkill in Roscoe and Bear Spring Mountain in Walton. The agency says the six often have occupancy rates of 20 percent or less and other DEC campgrounds are nearby. 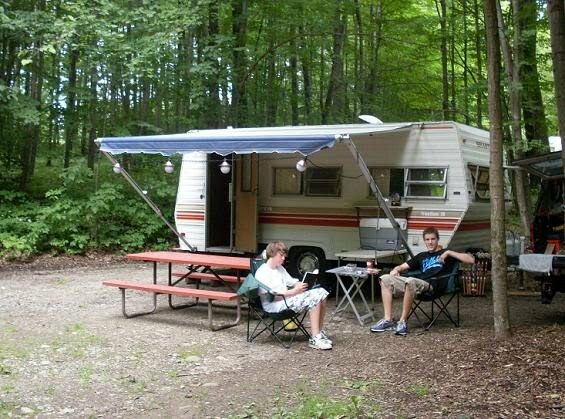 It manages 52 campgrounds and seven day-use areas in the Adirondack and Catskill forest preserves. Click here for more info on the Adirondack closings. The Internet is filled with advice for better blog writing. 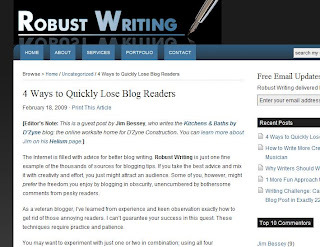 Robust Writing is just one fine example of the thousands of sources for blogging tips. If you take the best advice and mix it with creativity and effort, you just might attract an audience. Some of you, however, might prefer the freedom you enjoy by blogging in obscurity, unencumbered by bothersome comments from pesky readers. As a veteran blogger, I’ve learned from experience and keen observation exactly how to get rid of those annoying readers. I can’t guarantee your success in this quest. These techniques require practice and patience. Reprinted from the original hosted by Jesse Hines, of Robust Writing. Copyright 2009 Jim Bessey - all rights reserved. My sincere thanks to Jesse Hines, of Robust Writing - for the invitation and for sharing his valuable writing advice space with me for a day. How about you? Do you have any writing advice you'd like to share? If you'd like to submit your article for consideration, you can reach me via Comments or by using the link at the top of this page.